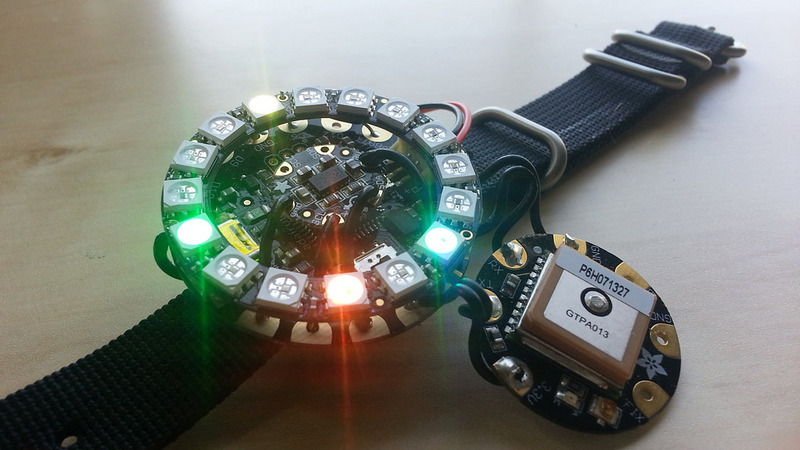 Geocaching Navigator Wristband #WearableWednesday « Adafruit Industries – Makers, hackers, artists, designers and engineers! After applying a few minor adjustments to the Adafruit NeoGeo watch Arduino code and a few months of procrastination, I’ve made a device that indicates roughly how far I am from any number of destinations that I set. All of the code I used is here on GitHub. The idea to create this little contraption came from my Geocaching adventures with my nieces and nephew: my little device currently tells me where a dozen or so caches are located in Windsor, Ontario, but I’ve also configured it to point me towards coffee shops and other places closer to where I live. Each light in the device corresponds to a target within 1 km of my current location. Notice that as I rotate, the lights hold their approximate directions of the targets. Red indicates close, blue indicates very far away.